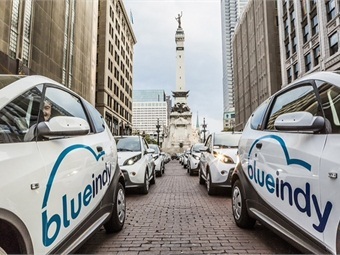 BlueIndy, the all-electric car sharing service in Indianapolis, has sold in excess of 1,000 memberships and provided more than 7,000 rides to members, residents and visitors since its launch last September. "BlueIndy provides all in Indianapolis, residents and visitors alike, with a convenient, affordable, and cleaner driving option" said Scott Prince, GM of BlueIndy. “The adoption of the new service has been stronger than we had hoped and we could not be more delighted to be providing a service that many really needed. Whether it is folks who do not own a car but need one from time to time, others deciding to become a “one-car family”, students deciding not to bring a car to campus, or professionals commuting with our Bluecars, we enjoy learning daily how new members use the service to meet their transit needs." The BlueIndy fleet currently has 120 electric cars on the streets of Indianapolis. The Bluecar, manufactured by BlueIndy’s parent company Bolloré, is a three-door hatchback electric car which seats four. The car features a 30 kWh Lithium Metal Polymer (LMP®) battery, providing a driving range of about 120 miles. In addition to a growing fleet of electric cars, BlueIndy is opening 20 new stations by the end of February 2016, including two stations at Butler University, an additional station at the University of Indianapolis, and four stations at the Indianapolis International Airport. Each BlueIndy station has at least five Charge Points for electric vehicles. Members can reserve their parking spot and vehicle ahead of time by using BlueIndy’s website or mobile app. Learn more about BlueIndy's innovative car sharing program by visiting Blue-Indy.com.